Readers, I have been sharing about the hot springs in Ipoh that you should visit when you feel like having a quickie getaway out of the city but not too far away. 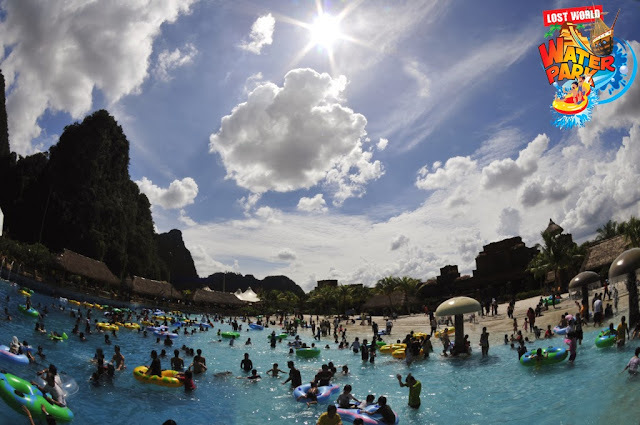 What I haven't shared about is the Lost World of Tambun theme park that one could enjoy during the day while at night one could relax and experience the Lost World of Hot Springs. It's open from 11.00am - 6.00pm with last call announced at 5.30pm. The park is closed every Tuesday except on Malaysian school & public holidays. 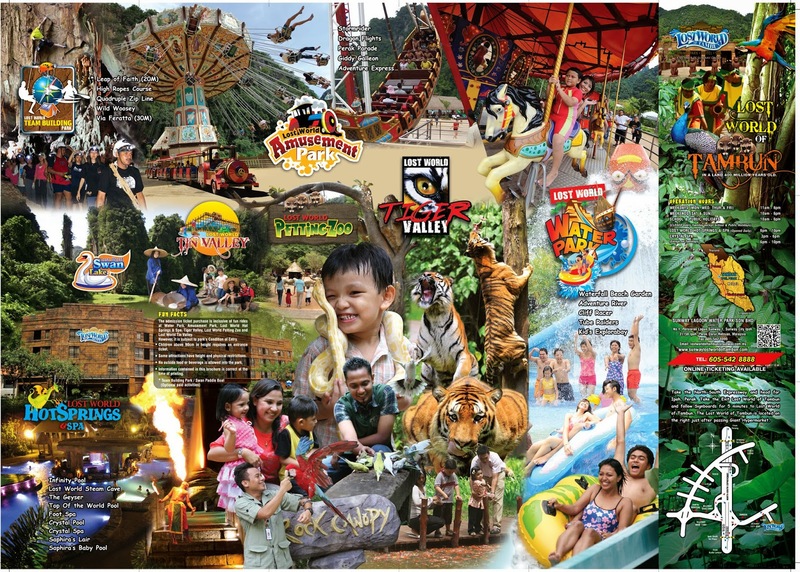 Entering the Lost World of Tambun, visitors face sheer cliffs covered with jungle vegetation that form the background of this picturesque theme-park. These towering hills with their limestone walls, pierced by caves and crevices are amazingly unique in Malaysia. The limestone hills of Kinta Valley are what remain of a massively thick bed of limestone deposited more than 260million years ago and brought to the surface by enormous tectonic forces. Now this theme park has both wet and dry parks to enjoy. 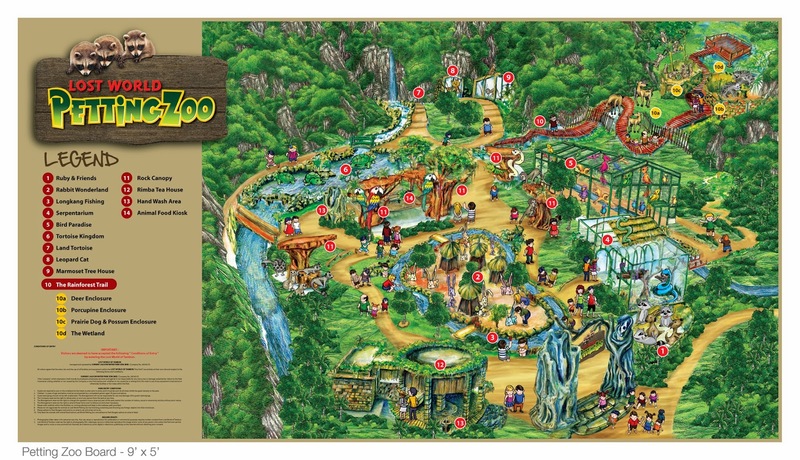 A total of 6 parks to discover in Lost World of Tambun. They are the Water Park, Amusement Park, Tiger Valley, Lost World Petting Zoo, Lost World Hot Springs & Spa and Tin Valley. 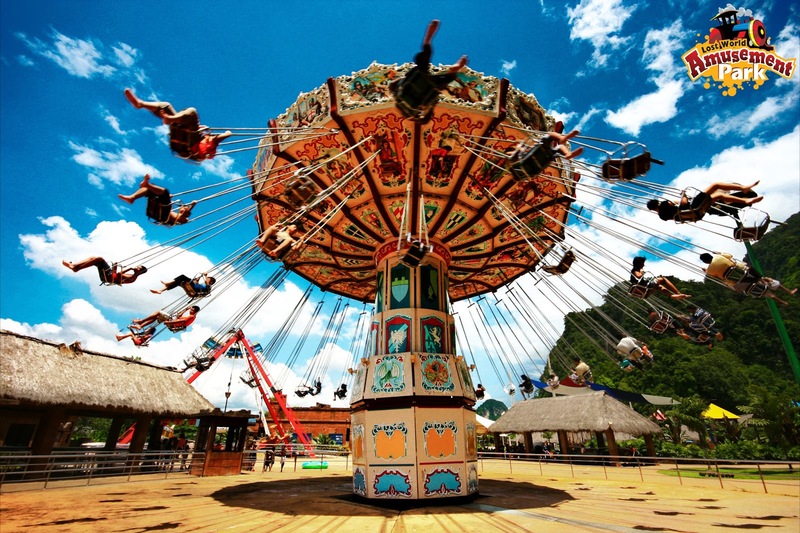 Each park is build with its own attraction so that the whole family would enjoy it together. I am not sure if the Lost World Team Building Park should be considered as the 7th park because it's limited to only when team building is involved. That being said, I did check out their team building packages and they're not that expensive. I suggested to my brother to have his team building done there if he's looking. Of course, an amusement park wouldn't be fun without the giggles and laughter of your very own friends. I went there with a group of girls, a very large one. Welcome by the Lost World of Tambun, we were introduce to the many sights and sounds of what lies behind the ancient walls surrounded by the lime caves and of course one of the wonders of Tambun is found inside The Lost World of Tambun! There is a total of 7 wonders of Tambun. This one wonder is called the Needle of Tambun which is also known as the "Pencil Hill" because it looks like a pencil sticking out of the ground. Standing proudly at the southern end of the Lost World. It's not everyday that you can see a beautiful limestone formed from several thousand of years ago. It's 8 meters high you know! (must take pic if you see it). Another place which I find especially beautiful is the Kepura Cave (lime cave) in Lost World of Tambun. I was told that many weddings took place in this beautiful cave. Corporate meetings can also be arrange with catering by The Lost World of Tambun. see how beautiful the cave is? after lunch, where should we go? let's go on an interactive tour first! we can't wait to tour the place! After our lunch session at the Kepura Caves, we went on to riding the Adventure Express, an ancient locomotive that takes passengers on a journey around the theme park passing by the majestic ruins, surging waters and wild tigers! I hop on and off this train whenever I spotted it just to enjoy the breeze on my face and admire all the attractions it brings me to. The Adventure Express brought us to the Lost World Petting Zoo where the infamous Ruby the raccoon runs from one tree to another begging to be fed with per food (which can be purchased at the entrance of this mini zoo). I didn't imagine this place could be so big because it's the home to 4,000 animals from 55 species! From mammals to reptiles to birds, one could just spent an entire day playing with the animals and watching the theme park guides feed them! where is the star of the show? we want Ruby the raccoon! don't let the snakes get you at the Serpentarium! sit on top of our heads! even the peacocks are so "manja"
well he managed to attract all the girls! We hop on back to the Adventure Express to go to the Tin Valley for tea and coffee. Now this place is really something I tell you. I should come back here for more photographs of this hidden beauty in Lost World of Tambun. Now this is my favorite park because there is a historical beauty to it. It reminds me of old Ipoh. Haha well you know before Ipoh became what it is known today, it used to be a rich tin mining area. Tin mining is one of the oldest industries in Malaya and Ipoh “The City that Tin Built”, became the meeting point of all the commercial centers of the Kinta Valley. Lost World Tin Valley aims to educate today’s generation in the rich heritage of tin mining in Ipoh. Hence the latest attraction in the form of a Tin Mining area which is equipped with a life-sized palung (sluice box), an original gravel pump monitor and a large area for young visitors to experience “Dulang Washing”(Tin Ore Panning) just like the good old days. Visitors can also learn about the history of tin mining and see real artifacts from the past at our Galleria. I love the way the whole park is build. My friends were happily climbing on top of the elephants (the transportation back then) while others joined in the tin mining experience called "Dulang Washing". It's how tin were mined in back in the old days. I jumped right into the cold water that took the heat of the day away. Managed to mine my very own batch! (can I bring it back? haha). There is also the Tin Trail where you learn how tin can be made and the Tin History Walk to learn about the tin mining history and facts. take a picture of us please! so who's the first to successfully do this? not me lah, but I finally got some tin too! This place is fantastic right? I wish I could spent more time with the "Dulang Washing" experience. It's so much fun! But hey I am hungry right now and it's time for tea so let's go to the Dulang Teahouse to eat some charcoal toast bread with kaya and butter. This tea house serves kopi kampung (village coffee), telur ayam (soft boiled eggs), biscuit lutot (hard biscuit), roti bakar (toast bread) and roasted rice tea. It's what the tin miners eat during tea back in the old days. I really love how they put this in the Tin Valley's attraction to make it feel so complete. come right in to the Dulang Teahouse! 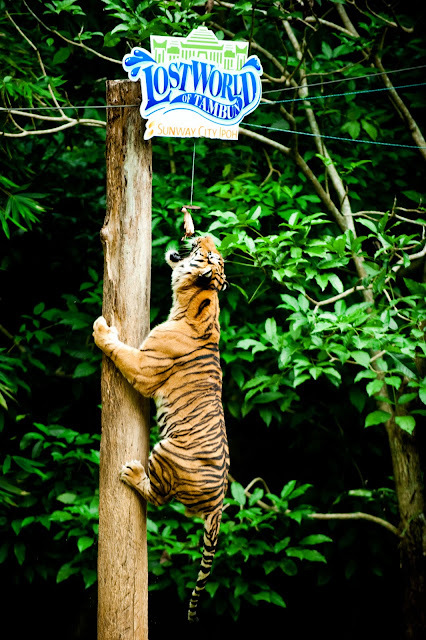 I had to go back to the hotel to get ready for the Lost World Hot Springs & Spa (click here to read my experience) so I didn't get to explore the amusement park, water park and Tiger Valley fully. Maybe another time when I come back again. There is just so much more to explore and so little time because the theme park closes at 6pm. Of course I couldn't resist the waterpark. I didn't missed having my own fun floating on a giant air tube along the Adventure River, a 600 meter length river. I rented the tube raider (that's what it is called I think) with Illy and we scream and hide whenever a surprise shower come down on us along the river. It was quite nice floating and enjoying the scenery of caves and out-of-the-world water features along the way. Lovely!!! I want to add that the first roller coaster in Perak is found here! I did get a ride on it after my friends tricked me into believing it's a "baby ride" because I am terrified of heights and being on rides that I can't control! (roller coaster, speed boats, airplanes). I get panicky and faint! Don't believe your friends when they tell you it's not scary at all. It's definitely a scream fest for those who enjoy the thrills of what an amusement park has to offer. 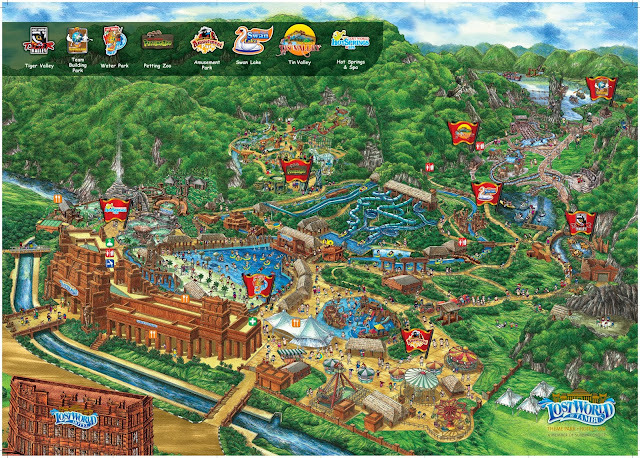 Visit www.sunwaylostworldoftambun.com for more information about the theme park and how to get tickets!